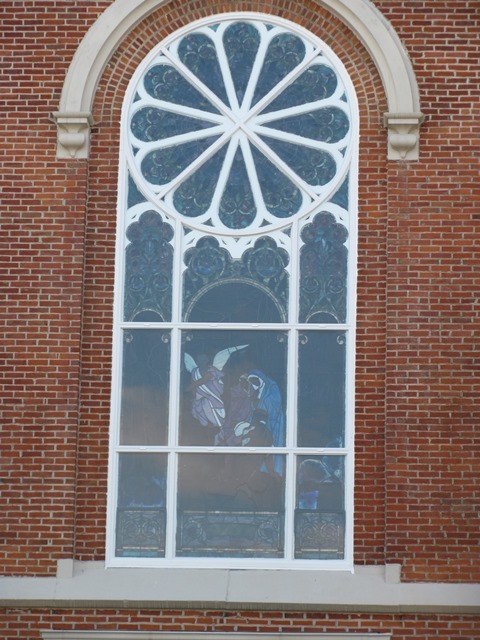 With these services coupled alongside our stained glass work Window Creations, LLC has become a full service studio that can supply churches with one contractor to service all their window needs. We also have state of the art equipment to complete these projects including multiple lifts that range from 25’-75’ working heights. We also utilize computer software including Auto-CAD to streamline the fabrication of custom frames that can match virtually any existing wood frame if desired by the client. There are two different methods for installing protective storm glass coverings. These methods differ because of window type, size and style. It is very important that the method chosen compliments the exterior of the church. The inset method is where the glass is inset into your existing wood frame. The outset method is where we install an aluminum extrusion on the exterior side of the existing frame. There are advantages to each depending on your preferences. This is the least expensive because no new framing is needed. You are still able to get to some of the exterior wood to paint in the future. Some of the wood framing is exposed to the weather especially moisture. Does not allow for expansion and contraction of the frame sometimes causing breakage of the storm protection. Makes installation of the plate glass look more uniform. More expensive to install due to the added cost of the frame and the added cost of labor to drill into the brick masonry. Glass would all need to be removed to paint any of the wood in the future. It is our recommendation to use the outset method in most applications to preserve the wood and paint as long as possible by sheltering it from the weather. If done correctly, with the use of venting this will give the stained glass and the current wood framing the most longevity.